Make cursor from source and mask; cursor size should at most 32x32 for portability! Make cursor from FXColor pixels; cursor size should be at most 32x32 for portability! To get to the option flags. Set pixel data ownership flag. Get pixel data ownership flag. 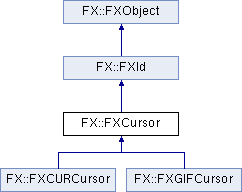 Width of cursor; returns 0 for stock cursors. Height of cursor; returns 0 for stock cursors. Set hotspot x; returns 0 for stock cursors. Get hotspot x; returns 0 for stock cursors. Set hotspot y; returns 0 for stock cursors. Get hotspot y; returns 0 for stock cursors. Check if there is color in the cursor. Release pixels buffer if it was owned. Save cursor to a stream. Load cursor from a stream.